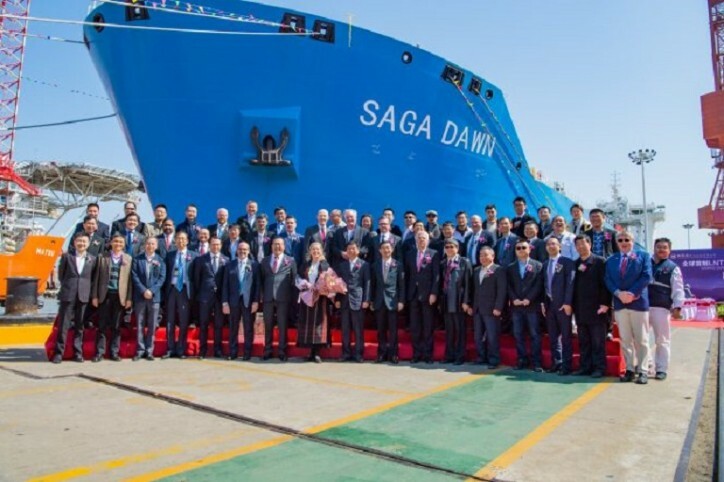 Saga LNG Shipping on Wednesday named its new liquefied natural gas carrier Saga Dawn at China Merchants Heavy Industry (Jiangsu) in Haimen, China. The 45,000-cbm LNG carrier will be delivered in May and enter into service shortly after. Saga Dawn is the world’s first LNG Carrier featuring an IMO type A LNG containment system, based on LNT Marine’s patented LNT A-BOX design, Saga LNG Shipping said in its statement on Wednesday. The ABS-classed vessel was built at China Merchants Heavy Industry’s Jiangsu yard and features Wärtsilä dual-fuel main and auxiliary engines. Speaking at the naming ceremony, David Wu, founder and CEO of Saga LNG Shipping said it is a day of many firsts as Saga Dawn is the first LNG carrier to be built at CMHI, the first ever LNG carrier to feature LNT Marine’s A BOX technology, and the first vessel in Saga LNG Shipping’s fleet. “Saga Dawn brings new life to the dwindling midsized LNG fleet. With difficult to reach end-users in mind, the vessel has a fully laden draft of only nine meters and has no partial loading restrictions. The vessel is a preview of what is to come in the rapid development of midsized LNG infrastructure. We expect Saga Dawn to pave the way for new business models, innovative trades and the opening up of stranded demand centers, especially in Asia,” said Jonathan Verswijver, VP of business development at Saga LNG Shipping. Saga LNG Shipping noted it is currently in the final stages of development for an 80,000-cbm LNG carrier design nine meters fully laden draft, aimed at regional imports into Chinese terminals. Saga has further developed and obtained approvals in principle (AiP) for its shallow draft 28,500-cbm Wuhan Max and 12,000-cbm Yichang Max designs aimed at opening up trade along China’s Yangtze River. Based around the LNT A-BOX® technology, Saga LNG Shipping aims to build, own and operate a series of tailor-made small and midsized LNG assets targeted at projects currently in various stages of development. Types of assets included in Saga LNG’s scope are FSUs, LNG barges and LNG carriers, FSRUs, FLNGs, and LNG bunker vessels, all within the 1,000 to 100,000 cubic meter range.